Water Falls From the Sky. News at 11. Remember when I was complaining recently about our lack of rain? Well that is now over. The lack of rain, not the complaining. It started raining over night and we have gotten a nice dose of the wet stuff. I put Honey the dog out this morning and she didn’t know quite what to do. The ground was wet! Every time she moved out from under the over hang water fell on her! I didn’t trust her to do her business, so I stayed out there with her. Next time I will take an umbrella. It took me getting out from underneath the overhang with her to finally get things moving, shall we say. Of course, this being So Cal, we can’t have just normal rain. I guess a real wing ding of a storm is coming up after this one. It is all over the TV news. Batten down the hatches! Get out the sand bags! Most rain in three years! Thunder storms! So I have turned off the sprinklers, pulled out a sweatshirt, and am enjoying this little interlude of moisture. Bring on the rain! It is Time to Get Serious! It is the end of February folks and I decided this past weekend that it was time to get serious about getting those delicious oranges off the tree and distributed to neighbors, friends and coworkers. 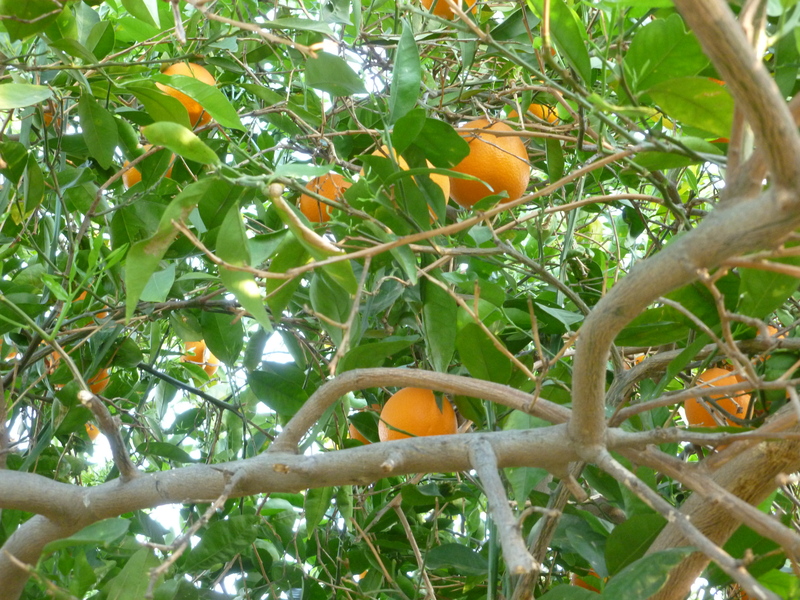 Mind you, that had already been going on since the end of December, but those were the “wimp” oranges, the ones I could pick just by reaching out and plucking them off the tree. But there are more, many more left on the tree. As you can see, there are still quite a few oranges way up high, and I can’t reach them without a ladder. 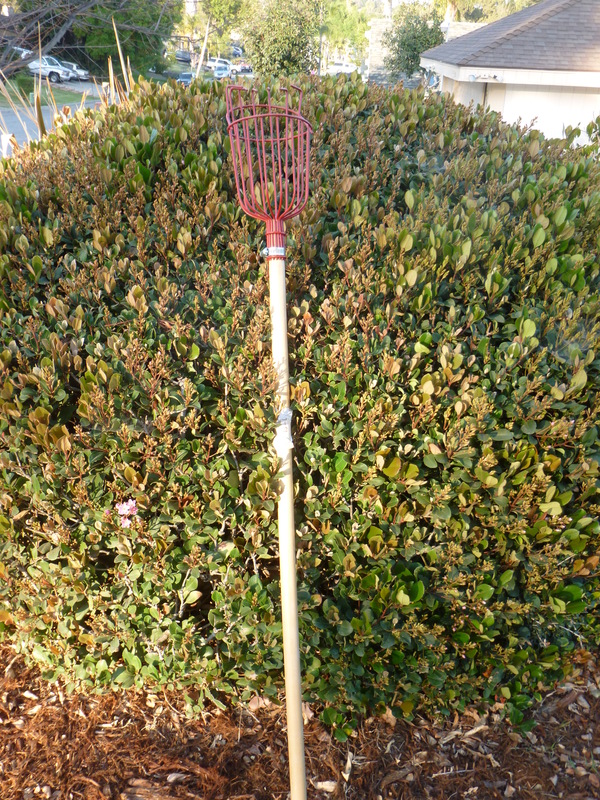 I am not going to drag the ladder out of the garage so yesterday I brought out the big gun – the orange picker. 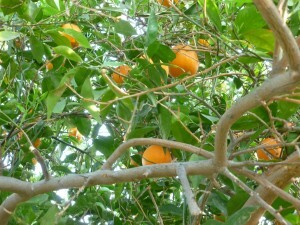 Can you see all those oranges hiding deep in the tree? 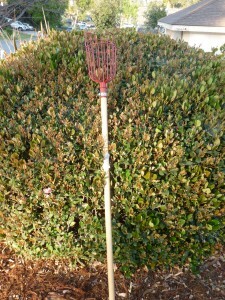 They are too high to reach and are buried so deep amongst the twigs and branches that the orange picker is useless. That is when I bring out the really big gun – Hubby! I think he sees it as a challenge, kind of like a computer game. 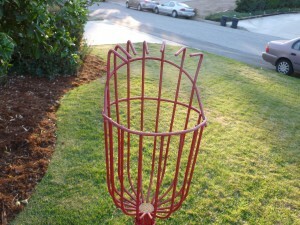 He finds a way to ease that orange picker deep into the tree to get those hard to reach oranges. Sometimes he turns the orange picker around and uses the handle to try to knock the oranges out of the tree. Whatever the case. he is the one who is sent in to get the last of the hard to reach oranges off the tree. 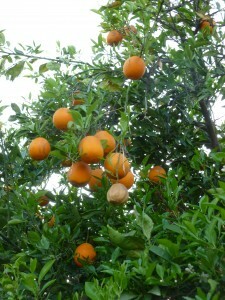 Lots of people have orange trees in my neck of the woods. 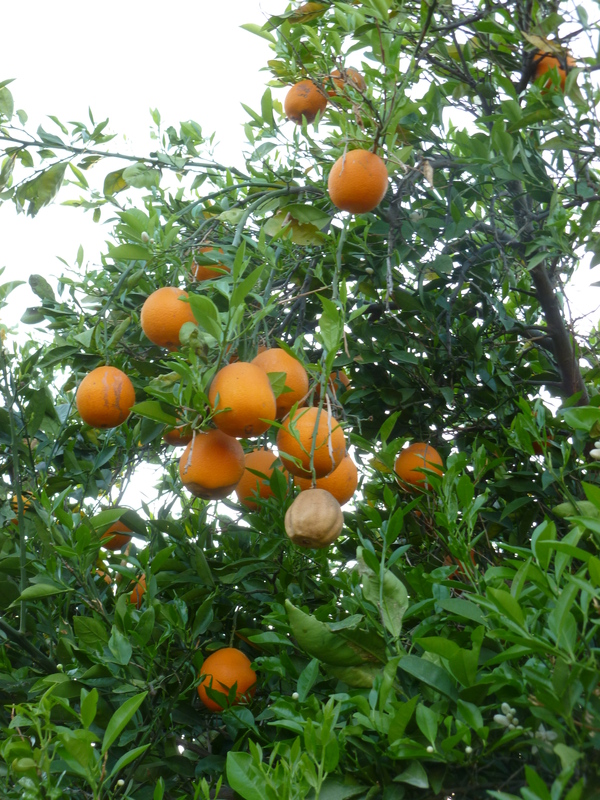 But my orange tree isn’t a regular Navel, it is a Red Navel, or a Cara Cara orange tree. So I can usually get folks to at least take a few. I had a meeting at my house last night and everyone got a free parting gift – oranges! Today I am going to juice some for Hubby. Yep, it is that time of year and it is time to get serious!!! Two blogs I follow (Pioneer Woman and NieNie Dialogues) posted about skiing this week . I have a hard time relating. Living as I do in the low lands of Southern California, snow is not my thing. You may be surprised to know that we have all kinds of mountains around here that, at this time of year. usually have snow. Even if we are a little lacking in snow the ski resorts make the white stuff so Southern California residents can enjoy skiing. Yes, on a nice winter day we could bask in the sun at the beach in the morning, pack up our gear, and be skiing by afternoon. 1. 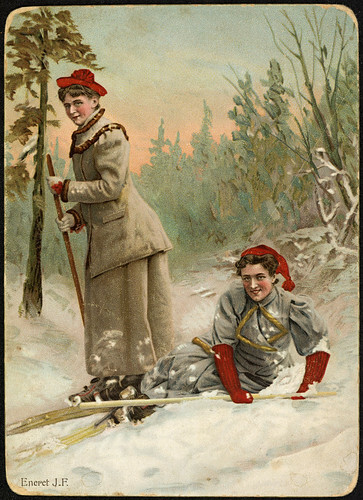 I am not a natural skier, no matter what my boyfriend at the time wanted to believe. 2. Snow reflects 100% of the sunlight. Reflects it up, as in up into your nose. Have you ever had a sunburn inside your nose? I have and it isn’t pretty. 3. The wind causes the snow to swirl around the base of trees, creating wells several feet deep at the base of said trees. Inexperienced skiers can fall into those deep wells. While resting at the bottom of the deep well, looking at the sky and contemplating how they are going to get out of that mess, small children on skis can almost fall in on top of the inexperienced skier. Believe me, I know this from experience. 4. Finally, I learned that men who love skiing and women who don’t are unlikely to stay together. Which is no problem, because I went on to find Hubby and he and I happily stay out of the mountains in the winter. We look up, admire the beauty of the mountains covered with snow, and then shake our head at the crazy people who go up to the snow on purpose. My kind of guy! Yesterday, Blackie the cat turned the big 1-5. Yes, fifteen years ago he was born to a stray kitty in the front planter of our previous home along with three other little boy kitties. Just the day before his birthday we received the good news that his hyper-thyroid condition is being kept in check by the Hills Y/D food and all his other blood work looked great. I hope he considered that $85 blood test his birthday present because that is all he is getting…. 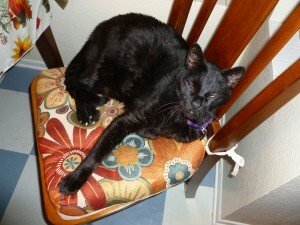 Blackie in one of his favorite places, the kitchen chair. This particular chair gets the morning sun, so it is a perfect place for a cat, even if it is a bit small for Blackie’s big self. In the months leading up to the end for Brother Dear, he mentioned things he wanted to do that were on his “bucket list.” You heard about most of them. They mainly consisted of shows or people he wanted to see, and jumping from an airplane. It made me contemplate the concept of bucket lists very throughly. I decided I don’t have one. I thought about the times in my adult life when I have been the happiest. I realized that, during those times, there three people who have always been in the room (or in the car) - Hubby, Eldest Daughter and Youngest Daughter. Hubby has a great sence of humor - dry, sly, with a dab of puns and a good dose of silly thrown in. The girls have a good sence of humor, too. Some of the best times in my life have been spent laughing with them. My family also likes music, especially good old rock and roll. We have enjoyed sharing music with the girls since they were tiny babies. When we are all in the car together the radio is always on or a CD is playing. So I started thinking about what my perfect day would be. I decided it would be the four of us in the car, the music blaring, on our way to or from a great used book store. Something would come up that would make us laugh. Maybe a story about the dog or the cat, or one of the girls will start telling us about something going on in their lives, putting a funny spin on it , of course. We would all be laughing until Gladys Knight and the Pips’ “Last Train to Georgia’ comes on. For some reason that is our song. The laughter stops and I yell “Sing, everybody, Sing!” Everyone will pick either Gladys or the Pips to sing with and we all belt it out to the very last note. And when it is done we start talking and laughing again. Ahhh…perfect! Do you have a bucket list? If so, what are some of the things on it? In honor of President’s Day, here are some fun facts about our presidents! 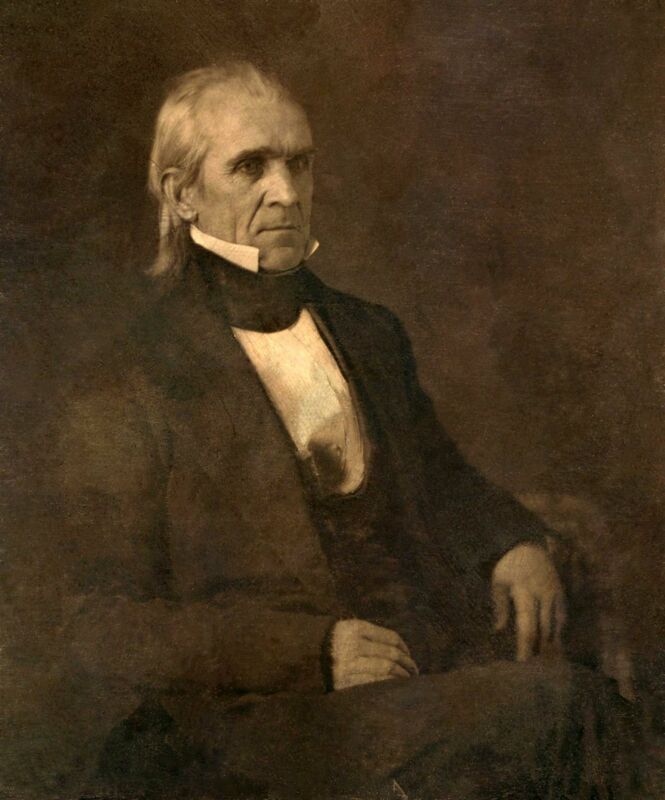 Our 11th president, James Polk, was the first to have his photo taken. FDR was the first President to ride in an airplane. This photo shows him on his very first flight. James Garfield was the first left-handed president. John Tyler had fifteen children, eight with his first wife and seven with his second. He fathered more children than any other president. He was obviously a very busy man, but his poor wives were even busier! 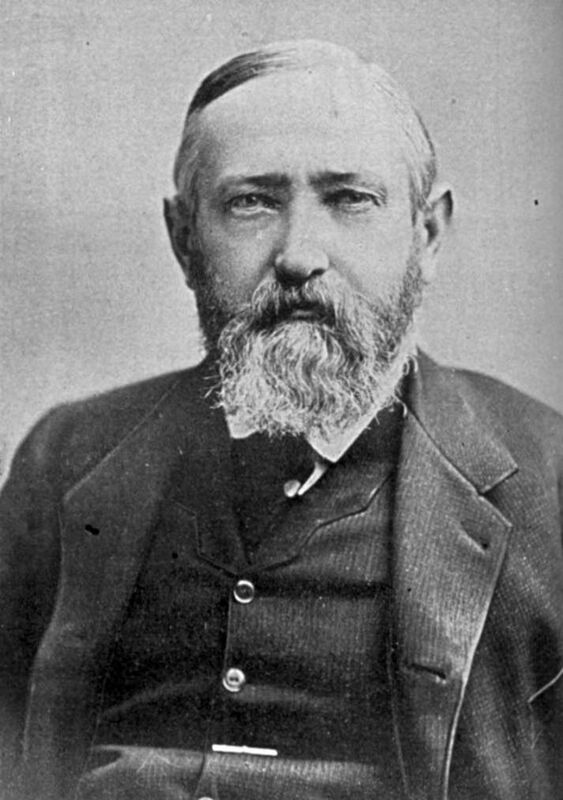 Benjamin Harrison was the first president to have electricity in the White House. However, sure he would be electrocuted, he would never tough a light switch himself. 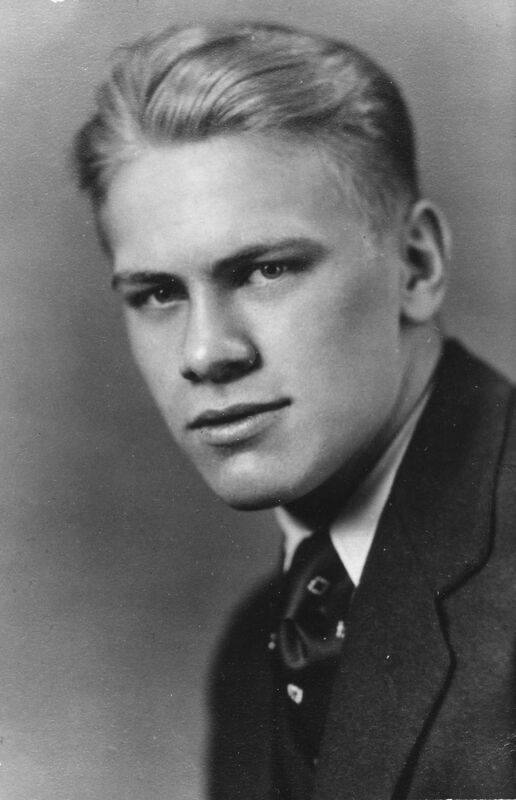 Gerald Ford worked as a fashion model when he was in college. 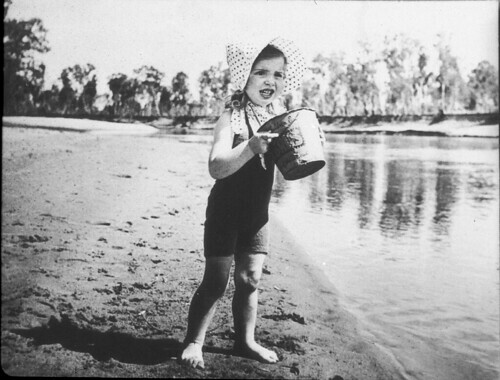 He appeared in a photo spread in Look magazine in 1940 and on the cover of ”Cosmopolitan” magazine in 1942. It is time to let you in on a little secret of mine. I love the color red and I like pink pretty well, too. Such bright and cheery colors! I also love hearts. Just slap a heart or two on something and I am bound to love it! So this time of year just makes me happy. Where ever I go are wonderful red and pink and hearts! Shopping makes me so happy right now! 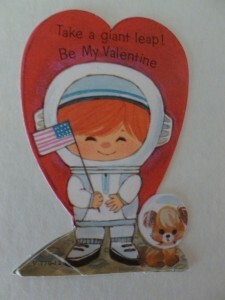 Along these same lines, about 20 years ago or so I started collecting old valentines. Again, all that red and hearts too! Plus silly little sayings and funny puns, and what isn’t there to love? I also find valentines to be the perfect collectible because I can put them in the pockets of photo album pages so they are easy to store and don’t take up much room. 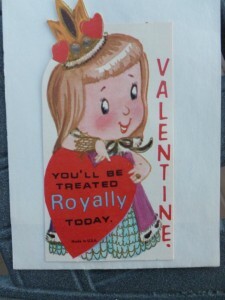 A week ago Eldest Daughter went shopping at an antique store and brought me back a little valentine. Isn’t it cute? 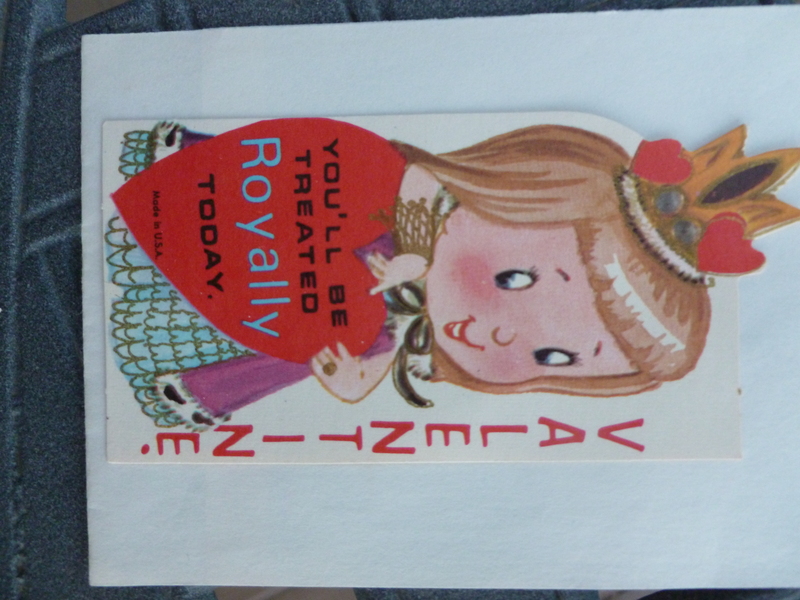 It caught my eye on Friday…and I decided to go on eBay, where I have purchased most of my valentines in the past. After all, at this time of year there should be quite a selection….big mistake! After bidding on five different lots of valentines I had to tear myself away and call Hubby to admit my transgressions. Of course, I didn’t win them all. I only ended up winning two of my bids. The valentines I love the most are the ones from the 30s through the early 70s, particularly valentines that reflect the culture of the times. 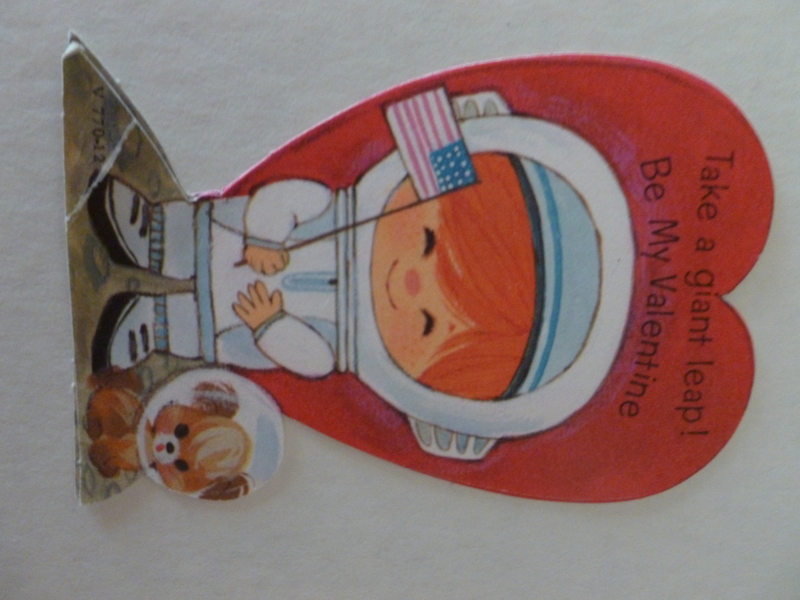 The valentine that got me started was one that had a little astronaut on it that said “Take a giant leap, be my valentine.” Get it? It must have come out right after the moon landing in 1969 when the phrase, “One giant step for man, one giant leap for mankind” became part of our history. 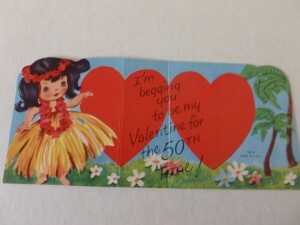 I also have a valentine that mentions Hawaii becoming the 50th state. So, now you know about my secret obsession with all things hearts and valentines. I hope you have a Happy Valentine’s Day this Friday! I recommend eating something red or pink just for the fun of it! I immediately thought of Eldest Daughter. She has loved snakes ever since a little black rubber snake entered her life when she was three or four. 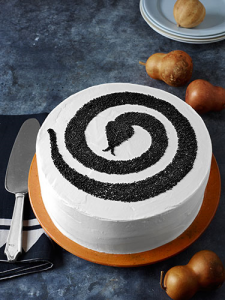 Somehow the little snake was named “SS” for Sneaky Snake and the rest is history. The minute I saw this snake cake I knew I had to make it for her. 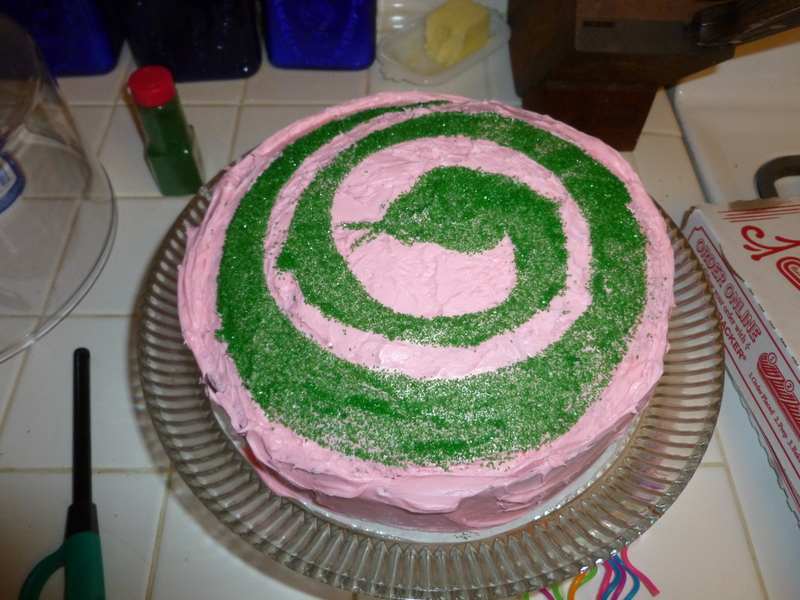 It wasn’t perfect but it was made with love for my snake loving daughter. She liked it. That is all that matters! 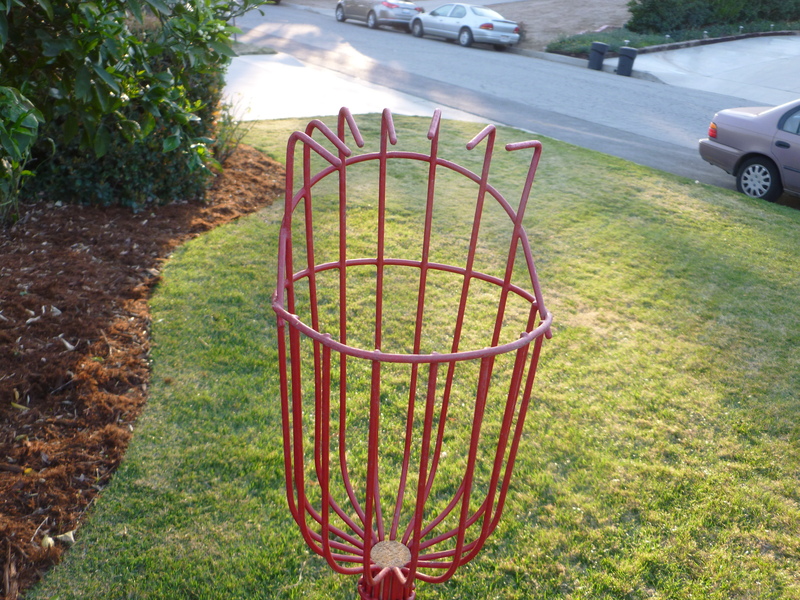 It never rains in California….. I am very happy to report that the famous song lyric is wrong, wrong wrong. It has returned to winter weather in my neck of the woods (at least for the time being) and today it actually rained! Yes, a decent amount of water actually fell from the sky! The annoying puddle that forms in my driveway every time it rains returned and I happily turned off the sprinklers. It was raining a bit when I went to the grocery store about 4:30 and I didn’t bother with an umbrella. After all, it was only water! One outfit, size 18 months with hat and socks to match, because babies grow fast and I figure it is nice to have something they can wear latter. “Moo,Baa, La La La” by Sandra Boynton. This is one fun board book. It is written in rhyme and as a parent you will soon have it memorized. This comes in handy on car trips. I can’t remember the number of times I recited this book while driving with a bored child or read it to a toddler getting ready for bed. I feel parenthood is impossible without this book! Two baby toys. Anything to keep that little human entertained! Two small vases – Once a a little tyke starts walking he/she loves to pick dandelions and give them to mom and grandma. The vases are so they have some place to put the dandelions your little darling gives you. Bonus gift # 1- a pair of baby blue knitted Winnie the Pooh booties just because they were so cute. Bonus gift # 2 – A cute bib with velcro closure, cute and useful! Drool, anyone?